When my husband and I first decided to move to California, it was a decision filled with mixed emotions for me. I was pregnant and going to be VERY pregnant when the move was actually happening plus I was leaving behind a lot of dear friends. Not to mention all the logistics of selling our house, renting a new one, and shipping everything cross country. It makes my head spin just remembering. So let’s just say I was not terribly excited at the prospect. My husband finally asked me in exasperation if there was anything I was looking forward to about the move. I thought for a few seconds and said yes, I’m looking forward to finally going to Hawaii.We made our first trip to the big island last December over the holidays and absolutely loved it. You always hear how beautiful and amazing Hawaii is and, if you are like me, wonder if it is going to live up to your expectations. Well, for me, it did and exceeded them. I was immediately plotting a return visit to check out Maui. And we just went in mid-August. It was a fabulous vacation, even with two small people under the age of 5. We stayed just north of K’aanapali just off Honokawai beach which was perfect for us. Across the street was a farmer’s market and next door was a playground with beach access. I wish all playgrounds had beach access like this one. The beach is protected by a sea wall so it feels more like a tide pool. My kids loved it! Plus it was a big green sea turtle hang out and my son loved spotting those large, graceful creatures. I thought it only fair that I share some our yummy discoveries while we were in paradise. While in Hawaii this samosa junkie becomes an unabashed poke junkie. For those who have never had this addictive dish, it is essentially raw tuna (or other fish or octupus) tossed with salt, soy sauce, sesame oil, and a few other goodies. We tried it at several recommended places – Miso Phat, The Fish Market, and Foodland Farms (an upscale grocery store.) Our favorite version of the dish was found at a very well-stocked liquor store – Tamura’s. This place has a staggering booze selection with pretty reasonable prices for Hawai’i. And they also have great local food stuffs. On my return visit I will stop here first to stock up! 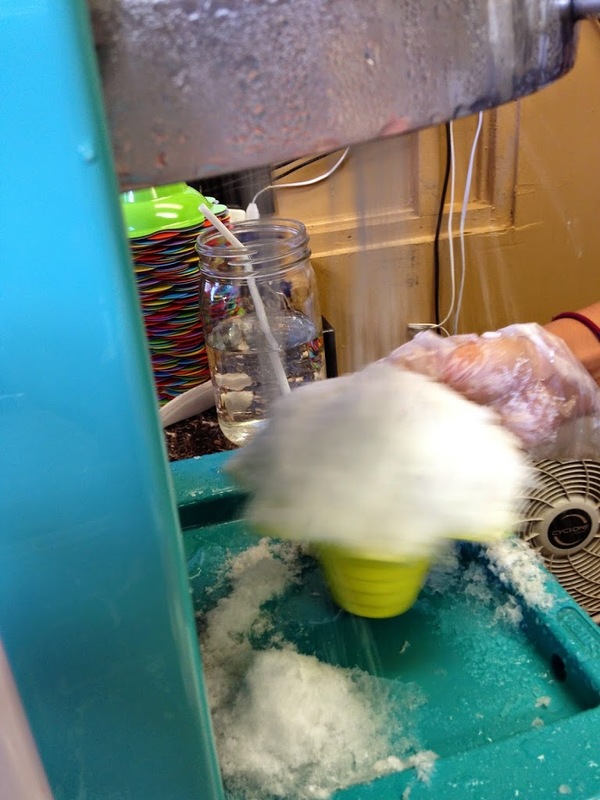 Another local food that we could not do without is shaved ice. I never understood the appeal of this sweet treat until I tried it at Ululani’s in Lahaina. They have the fluffiest shaved ice and make all their own syrups. I would always get mine with coconut ice cream and passion fruit syrup. 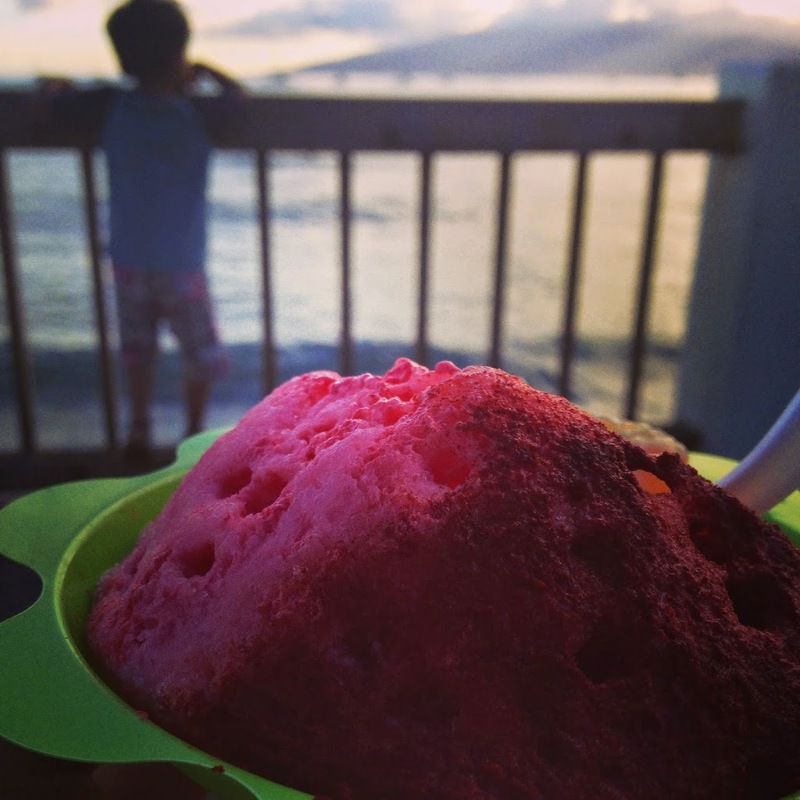 My husband was partial to the Li Hing Mui (a sweet, sour, salty explosion – reminds me a little of Indian black salt) and my son loved the kid’s rainbow. The secret at Ululani’s is in the perfect ice! 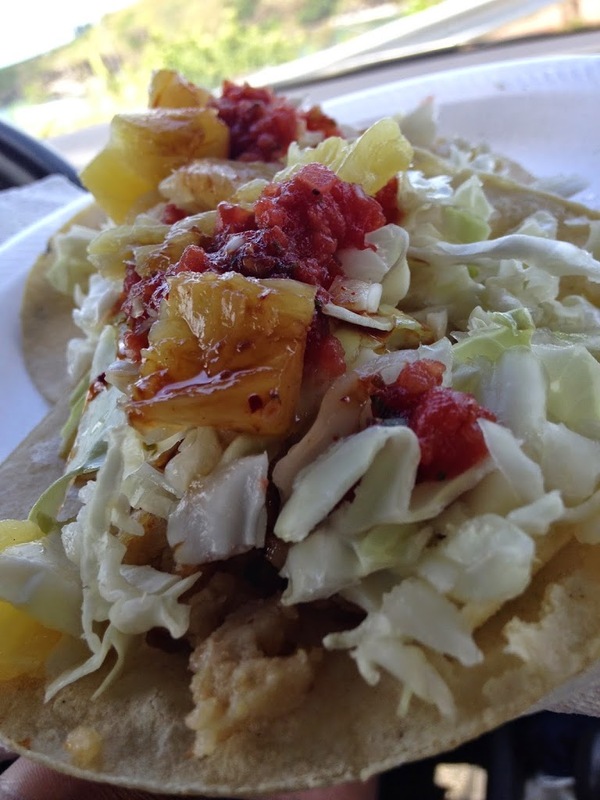 The best food truck meal we had was fish tacos where the meat had been smoked over guava wood. They were so ridiculously smoky. And on top was a fabulous pineapple salsa that was punctuated with habanero. It played beautifully with the fish. The food truck was found just before the turn out for Honolua Bay on Rt. 30. This was our favorite snorkeling spot. We saw many turtles, eels, and more fish than we could count. The water is pretty shallow so it feels almost like you are in a fabulous aquarium – the fish are so close! 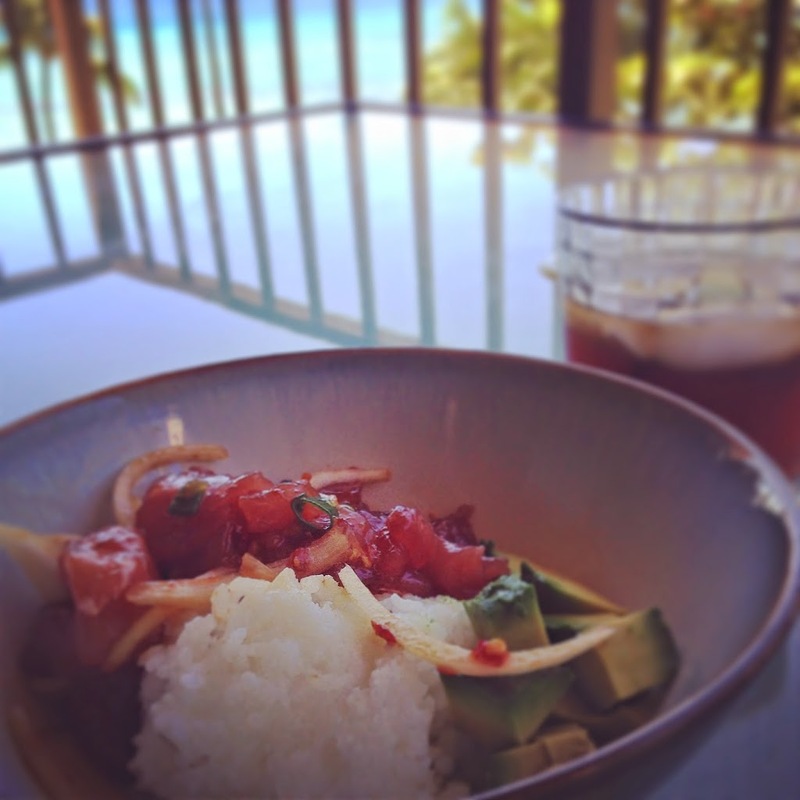 Our favorite sit down meal was at Mala Ocean Bistro. This gem is in north Lahaina so a bit off the beaten path. It is right on the water and very popular for sunset dining so definitely try and snag a reservation. 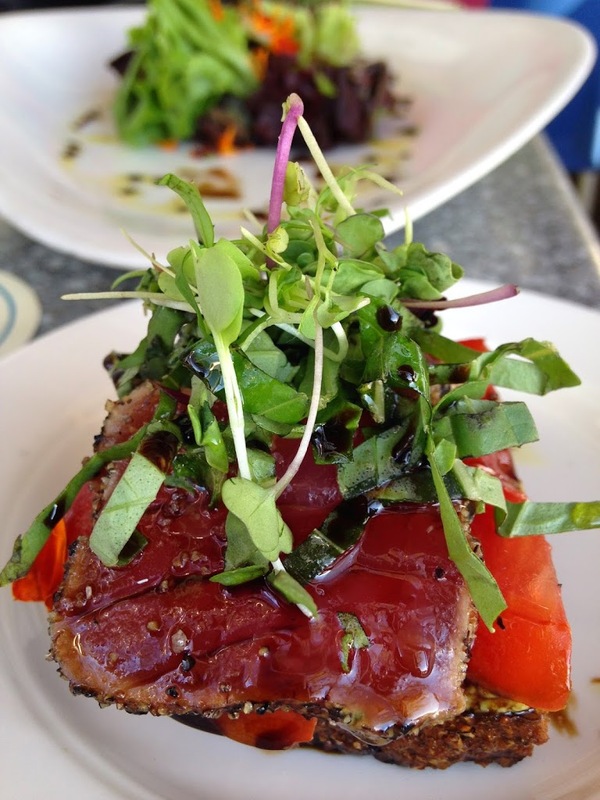 They are famous for their ahi tuna bruschetta. Ruby red fish on nutty flax seed bread drizzled with balsamic and clarified butter. I know it sounds like a lot is going on but trust me, it works! I had the ahi tuna for my main course and it was divine. I came with tender mashed potatoes and a killer spicy mushroom sauce that was just a little creamy. The kids had excellent fish and chips off the children’s menu. The homemade tarter sauce was divine that came with this dish – even I was dipping into it! For dessert we had the Caramel Miranda. It was a gorgeous selection of grilled fruit on top of a chocolate caramel base with ice cream. Just perfect. Still thinking about this dish…. And of course, I’m already thinking about our next trip….to Kauai in 2015! If you’ve been and have recommendations, I’m all ears!! Oh my goodness. I want all of this fish. Immediately. Oh my…how could I have taken so long to thank you for the Maui recommendations???? 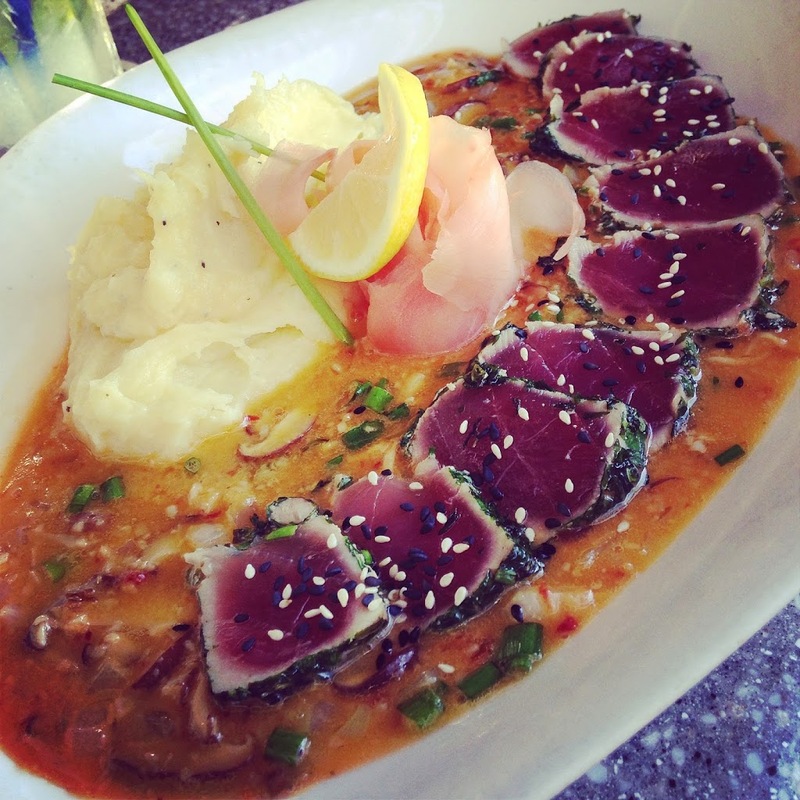 You were spot on about the Mala Ocean Bistro. We had a perfect waterside table (YES! ), a wonderful server and the most delicious food. Thank you!!!! Our only regret: we missed the food truck. I am SO glad you enjoyed Mala. That place is really special. Now I’m dreaming of Hawai’i….